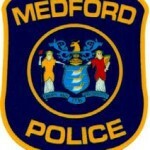 On Sept. 24, at 7:30 p.m., Medford Township Police, Fire, and EMS units responded to the 100 block of South Main Street for a motor vehicle crash with injuries. Investigation determined that the suspect was operating a 2015 Mazda 3 south on Main Street when for an unknown reason he left the travel lane and struck a parked 1997 Chevy pickup on the southbound shoulder of the roadway. The suspect suffered a contusion to his right forearm from the airbag deployment and he was transported to Virtua Marlton by Medford Fire-EMS for evaluation. The crash is under investigation by the Medford Township Police Traffic Bureau.